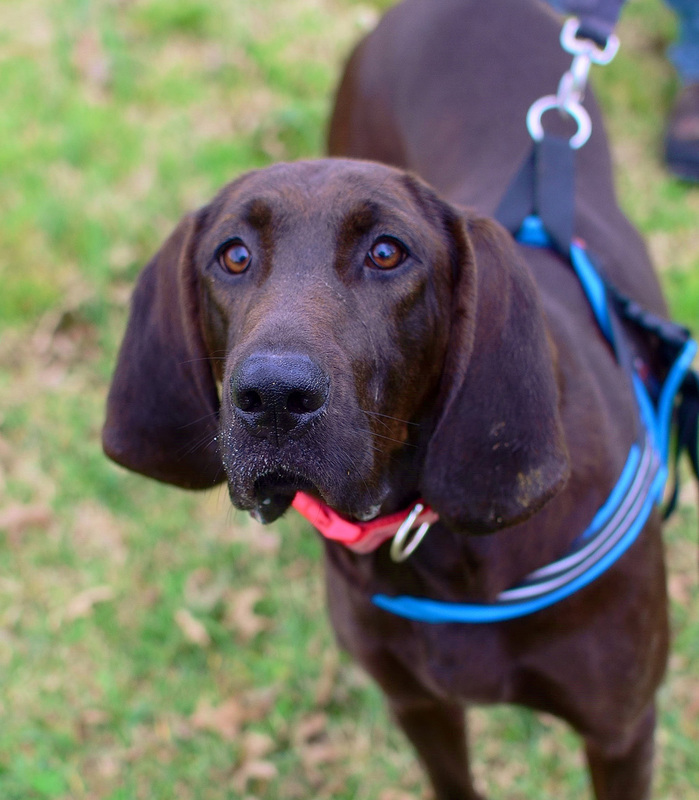 This Redbone Coonhound mix is even-tempered, amiable, and kindly, but a tiger on the trail. Sure-footed and swift, Dixie keeps her nose to the ground sniffing out whatever she can find to fulfill her innate need for wanderlust. She needs a large fenced yard to keep her close to home and to provide her ample room for exercise and play. Her adopter needs to be a firm, but calm, confident, consistent leader to help her stay mentally focused. Dixie loves people and would make a great indoor and outdoor companion for someone who enjoys regular outdoor exercise and will be sure to take her along. In a home setting, she is affectionate and wants to please; however, Dixie and cats do not mix. 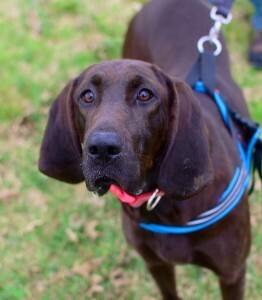 Like any true Hound, Dixie loves to hunt cats or any other non-canine pets. But with other dogs, she’s a peach! Meet this strikingly attractive, laid back girl and you’ll wonder why she waited so long to come into your life. A fuzzy, wuzzy, crazy kitten is Flint. At four-months-old he’s learning to flex his superboy powers of play. 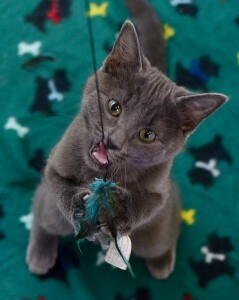 And play is what he does all day, and that could be due to his recent introduction to catnip — medicinal, of course. He plays with toys, people, blankets, lint, the air — anything really. And loving? This guy is already a master of amore, that’s Italian for “love.” And his affection of choice is smooching, that’s English for “kiss.” Yes, Flint knows his gorgeous blue gray coat gives him a leg up because when he’s not smooching others, he’s being cuddled by volunteers and staff. Flint’s the man, alright. How can you resist this comical charmer?